JMS has a useful interactive tool to calculate the size of spreader pads required when setting up a boom-type MEWP. 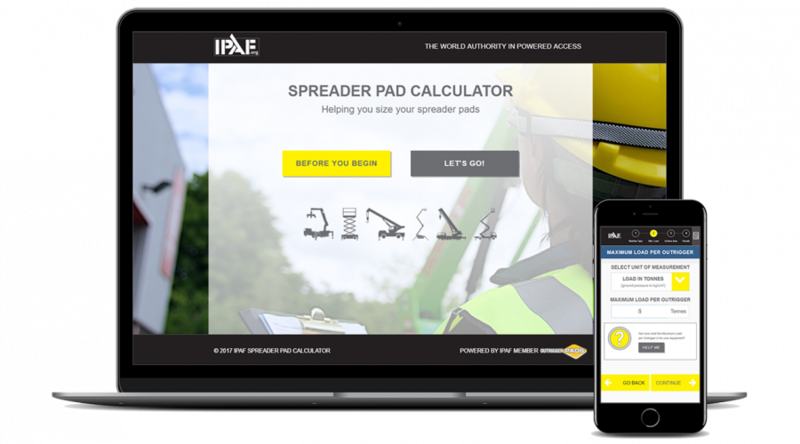 The spreader pad calculator, developed for IPAF, will help our customers choose the right spreader pads for each job by considering factors such as the maximum allowable ground pressure and the machine load per outrigger or wheel. The spreader pad calculator is a handy and easy to use interactive tool and is designed to aid the safe use of mobile elevating work platforms (MEWPs). It gives guidance to operators and others involved in determining the size of spreader pads needed when setting up a boom-type MEWPs where the weight will be fully supported on outriggers (also referred to as jacklegs). Poor choice of spreader pads (also called spreader plates) can cause machines to be unstable or even overturn. Prior to using the device, it is highly recommended to conduct an assessment of the ground strength. Once the gross vehicle weight of the MEWP has been entered, the spreader pad calculator displays the minimum area of the spreader pad. It also gives the minimum sizes of spreader pads required for different ground types and strengths. Ground strengths can be assessed in different ways, ranging from a visual inspection to a full geotechnical survey. For MEWPs, a visual inspection is usually adequate, as outrigger loads are relatively low compared with other machines, such as mobile cranes. However, it is essential that risks associated with each work site should be considered. Ground strength assessments must be carried out by experts with necessary knowledge and proficiency. The area of the foot attached to the outrigger of a MEWP is relatively small and consequently generates higher pressures on the ground. It is strongly recommended that suitable spreader pads should always be used under the outrigger feet regardless of the ground conditions. It timbers are used, they must be in good condition, dry, and of suitable thickness. Scaffold boards are not adequate. Spreader pads up to 900mm square or diameter must be at least 50mm thick. For further information on ground conditions, please refer to IPAF’s technical guidance on the assessment of ground conditions. Weight – Is measured in units such as pounds (lbs) kilogrammes (kg) tonnes (t.) and is a body’s mass or “heaviness”. The weight of a specific MEWP will be shown in the manufacturer’s operator manual. Force – Is a quantitative description of the interaction between two physical bodies, such as an object and its environment: for example, the load that a MEWP will impose onto the ground through its wheels or outriggers. Common units of force used by manufacturers are: kilogram force (kgf), pound force (lbf), and newton (N). Pressure – Is the force imposed over a given area. Common units of pressure are: kgf/cm2, kgf/m2, lbf/in2, lbf/ft2(PSI), pascal (Pa), newton/m2. Spreader plates used with MEWP outriggers spread the force from the outrigger leg over the area of the spreader plate, which reduces the pressure of the machine on the ground. Ground load bearing capacity – Is the maximum pressure a given area of ground can support. If the pressure pushing down on the ground from a MEWP spreader plate is greater than the ground load bearing capacity of the ground on which it stands, the MEWP will become unstable and at risk of overturning. The IPAF spreader pad calculator should be used for guidance only. Those responsible for assessing the ground and identifying the correct size of spreader plate to be used with any MEWP must do so in accordance with the manufacturers’ instructions and best practice guidance. In accessing the IPAF spreader pad calculator, the user acknowledges the above statement and agrees not to hold JMS or IPAF responsible for any damage, loss, or injury that may result from incorrect assessment of ground conditions or incorrect selection and use of spreader pads.